I typically wait a long time to do the non-knitting parts of a knitting project. Sewing on buttons is not knitting, and I’d always rather be knitting. So I have in my collection at least one finished cardigan that still needs buttons, and will probably remain button-free when I shuffle off my mortal coil. Ditto for pom poms. I love pom poms, don’t get me wrong. I really, really love them. They are so fluffy and festive, so full of simple joy. But making a pom pom is not knitting. And attaching a pom pom to a hat is even more Not Knitting than that, if you can believe it. I think I am also held back by Fear of the Unknown. It’s more fun to do something you’re fairly good at than something that feels like a shot in the dark. I like to know the Proper Way to do something, and with pom poms I’ve always been guessing. It’s a puppy pile of Stranded Diamond Hats and Slip-Stitch Caps, all of them photography samples for MDK Field Guide No. 8: Merry Making. I keep going back to look at this photo. Pom pom pulchritude! I want a stack of hats with pom poms that looks just like this picture. I need that in my life, dang it. Inspired by your photo, I screwed my courage to my Loome Tool. And you know what? Now I’m a fool for pom poms. I want to turn every random half-ball of yarn around here (and there are plenty) into pom poms, until I live in a pom pom-rich environment. A pom pom is a small thing. It’s a detail. But if it’s raggedy or misshapen, it can make a beautiful handknit hat look homemade instead of handmade. With Vilasinee’s videos, you feel like you’re sitting with your smart friend who has high pom pom standards. All of a sudden, YOU GOT THIS. 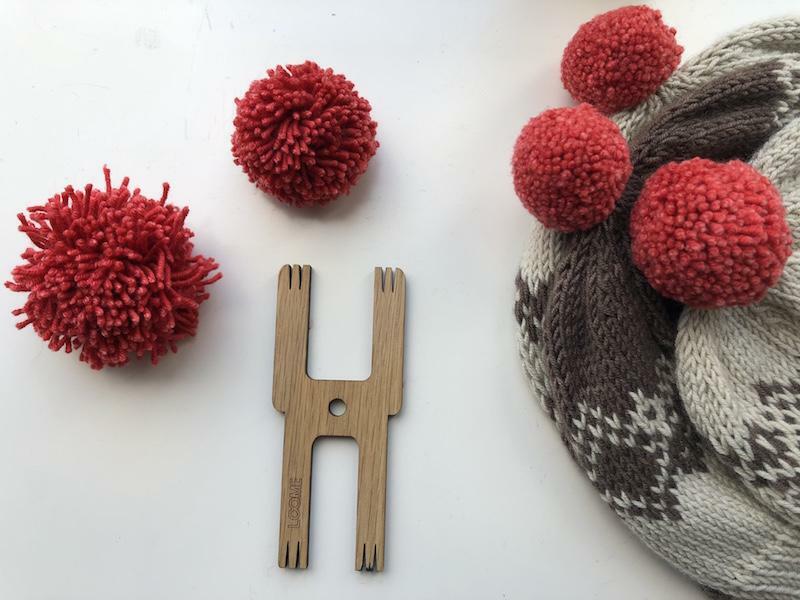 When a pom pom is fresh off the Loome Tool, it looks like the one on the left. Winsome, but with a pretty serious case of bed head. Then you trim it to achieve a tidy, dense orb shape, as Vilasinee demonstrates in the video at the top of this post. The trick: using a round template to guide your trimming. I used a small roll of washi tape as my trim guide, because I like to do things Ingalls-style. At the end of the trimming, I get a pom pom that looks like the one in the center of the photo, above my trusty Loome Tool. (This model is called the Robot). This is a good pom pom. It’s better than any pom pom I ever made in the darkness of my pre-Loome Tool days. The shorter you trim it, the more carpet-y it gets. I like mine medium carpet-y. But I wanted more. A kindly commenter suggested that a pom pom looks even better when it’s steamed. So I got a kitchen strainer, plopped a pom pom in it, and applied steam. Post-steam: That’s what I’m talkin’ ’bout! Steaming really takes a pom pom to the next level. It’s a fully-leveled pom pom. I would like to hold one cupped in my hand at all times. You don’t need to have a stand-up steamer like my beloved Jiffy in the video. Holding your strainer or slotted spoon over a kettle of boiling water will do the job perfectly. Be careful not to burn your hands! After making my practically perfect poms, I procrastinated for another three days before sewing them onto the hats. Why? 1. Weak character. 2. Not really knowing how to do it properly. Vilasinee to the rescue! Anticipating my need, Vilasinee has made a video on how to attach pom poms. It’s as simple as a thing can be. Just do it. When you’re done, there’s nary a wobble twixt pom pom and hat. Good news for gift-knitters: I got all three hats from two skeins of Enzo Aran, with enough left over for one nice pom pom, or an egg cozy. Red yarn is from my stash. The small hat is the 12-month size, the other two are the largest (adult) size. Voila! Three sock monkey-inspired Stranded Diamonds Hats: Baby, Mama and Papa, each with a securely attached topiary of fluff on top. Ready to wrap. I’m gonna need more hats. Join us in the Bunchalong! Before you know it, you'll have a pile of presents for holiday joy-giving. Totally agree that a lame pompom is worse than no pompom. Steaming = brilliant, and as delicious as dimsum. Oh, my gosh! Yet another use for my Jiffy! 🙂 I never like the look of homemade pompoms because they are so … Fresh-Haircut-looking. The steaming is GENIUS!!! I’m not sure how you do it, but you ladies always come along with exactly the piece of information I need, exactly when I need it! Last year it was the “how to sew on a zipper” tutorial, just as I finished a hoodie for my son that needed a zipper, and now steaming the pom pom, just as I finished a Tin Can Knits Snap hat. 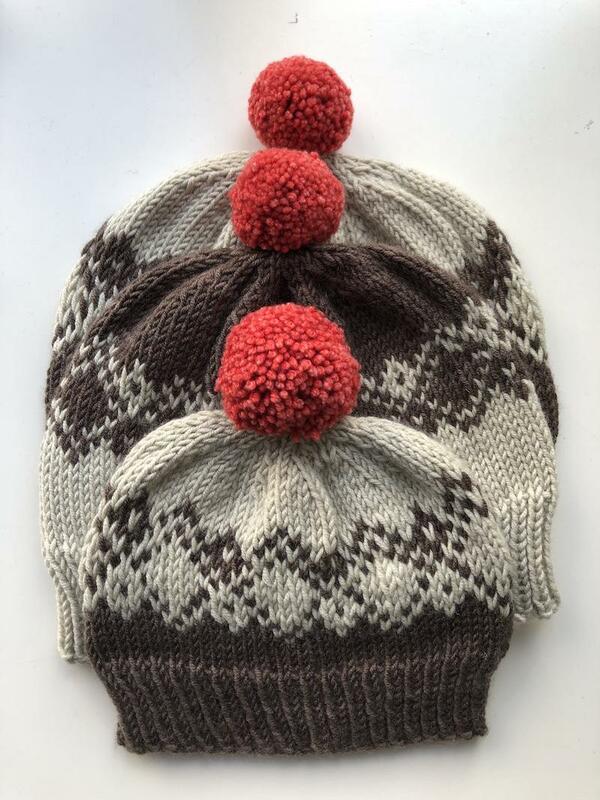 Just made a perfect pom pom in a mix of the colors I used in the hat (I’d send you a picture if I could–it’s that perfect). Thanks so much!! Now this makes perfect sense, but I never realized it before in making dozens of unsatisfactory pompoms. Duh! The trimming is key because it gets you down to the denser center of the pompom. The outer areas can’t be as dense because the angle veers away from the center, leaving you with strands that are essentially rays diverging. If you were to make a larger pompom you’d have to wind many more rounds to get an equivalent density. PS. I have to get one of these Loomes. Hypnotic. And Villasinee could market these to beauty schools. You could save your trimmings to use for another project, either for stuffing a small knit or crocheted amigurumi or doll (you can encase the snippets in a piece of old nylon stocking if you are worried about bits migrating out) or you can trap a colorful handful of snippets between pieces of packing tape, clear contact paper or clear laminating strips to make a snazzy yarny bag/ luggage tag (can include a card with ID info as well). Guilt free poms! Ever since I got the Loome tool from you guys I have been a fool for pom poms! I’ve made hundreds. Given them away. Finally I’m making a dent in my leftover sock yarn stash. My fellow knitters look at me strangely when I express my joy for this simple little non-knitting thing but I don’t care. However I never steamed them so now I will have to try that. Have to make more!!! More I say!! Wow!! I was wondering how you got the pom poms so meticulously floofy. Now I know! Oh I love this! Thanks for the videos. I have hats that are in serious need of pompoms and I have been procrastinating as one does. Bonus that they use up more yarn! Thanks. I too procrastinate on the non-knitting tasks. Fear of ‘unskill’? And then after I finally do them, I wonder why I was so fearful. And so I try to remind myself that it will really work out. — And thanks for the steaming tip! I might have to try this way of making a pom pom fluffy for the nieces. You know I want to do that just to use the cat brush. You ladies make me laugh and learn something every day. What a combo!! And then, when you’ve read the article, the comments are worth your time too. MDK brightens my day, thank you. I wonder if the Big Floral Damask Thing likes eating steamed pom-poms…maybe with a nice Chianti and some fava beans…. Beautiful sock monkeyish hat family! Loved the video, and also the picture with the washi tape because I didn’t quite envision how that would help with trimming but now all is clear. I understand about the Laura I. thing, too, as I have a basket full of socks that need darning and have been trying for weeks to conjure up my inner Louisa May Alcott. Goodness! Now I want to live in a Pom Pom Rich Environment! I actually make my pom poms removable by running three strands through the tie on and braiding each side. Pop through the top of the hat and tie in a bow knot. Kay, I think a large glass vase of beautifully steamed pompoms in a variety of colors and neutrals would make a nice decorative addition to any knitter’s home. Project ready! 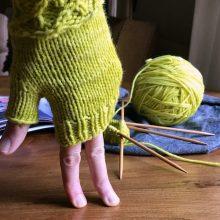 No need to rummage thru the stash for that perfect 1/2 ball of yarn to match your FO. 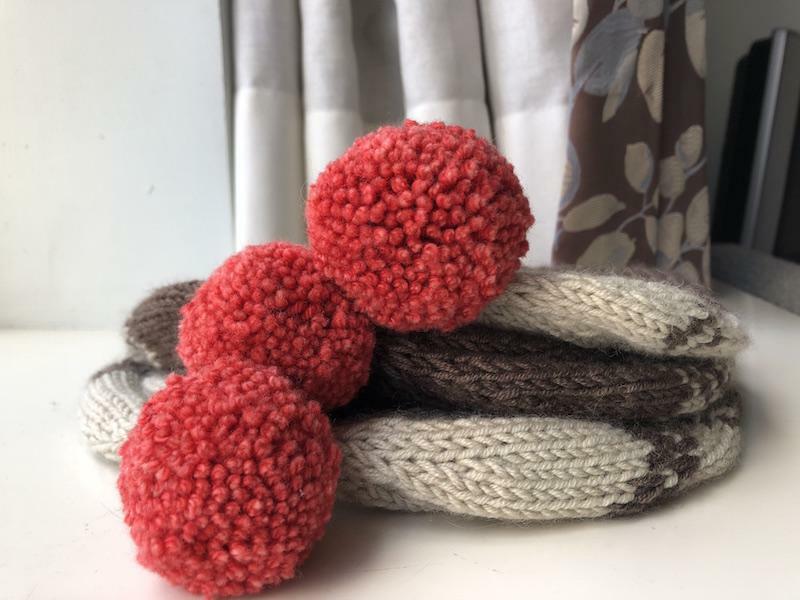 Hmm.. Maybe a pompom party would be fun for a knit group meet up- bring your 1/2 balls of yarn, steamers and pompom tools! Woot! 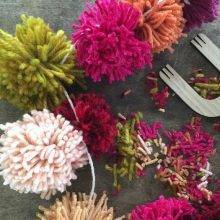 To tell you the truth, never in my mind would I have thought I’d be interested in making pom poms, but now I’m gearing up to do a bunch of steamed beauties to use as jar fillers, in place of bows on holiday packages and who knows what! Kudos to Ann for sucking me into this post – I missed the original earlier this week, but was charmed by her comment in this week’s Snippets. Who could resist, “To hear Kay tell it, you’d think she invented. . .” Such a southern statement that I felt like i was sitting and listening to my mother and aunts chatting over coffee. What a bonus for me – a great post AND a warm, gentle reminder of good times with those four lovely ladies. Dimsum…..or dim sum…..had to google it…..love words…..thanks for sharing. This is the most wonderful tutorial and I’m a pom pom fan forever now! Thank you Mason Dixon Knitting for always delivering the goods!